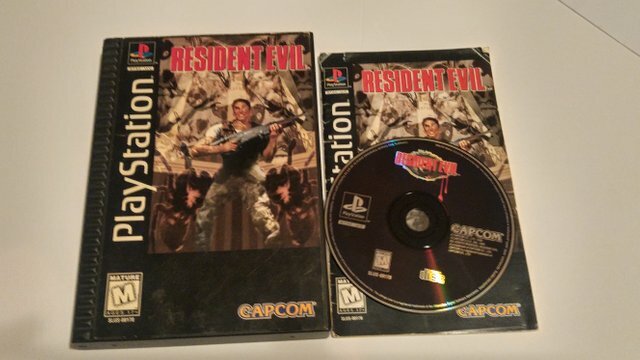 I remember being in a video game store at the time of the release and I saw on a TV the trailer of the Resident evil game and I fell in love with the game. So I bought it and I still have my copy today and here is the picture a long box and the game is on the playstation 1. The game was released in 1997 in North America and developed by Capcom. The game has another name for Europe and Japan which is biohazard. Remakes of the game have released on gamecube and lately on ps4 and pc. Resident evil 1 is a game of survival and horror and there were some cutscenes with actors during the game but especially at the beginning. You can choose in two characters Jill Valentine or Chris Redfield. It's a game where you have to kill zombies and solve puzzles and especially count rifle bullets. At first you enter a very large manor house in Raccoon City. The Resident Evil series has several games under its belt, some bad but most good. My favorite game of the series is the Resident evil 3 Nemesis with the boss who says STARZ I would like a remake of the third game will see in the future. The game I played the most and I still play is resident evil revelation 2 because of the raid mode, however the quest in the game is ok but the raid mode is really good; I bought it on ps4 and on the PC I'll maybe do an article on it later. This game opened me to the world of zombies and since I collect the zombie movies I have about a fifty. This post has received a 0.17 % upvote from @drotto thanks to: @brokenzombie. Release the Kraken! You got a 2.78% upvote from @seakraken courtesy of @brokenzombie! This post has received a 0.80% upvote from thanks to: @brokenzombie.